Someone recently asked how the ends are fiberglassed, so I thought I’d dedicate a post to that. 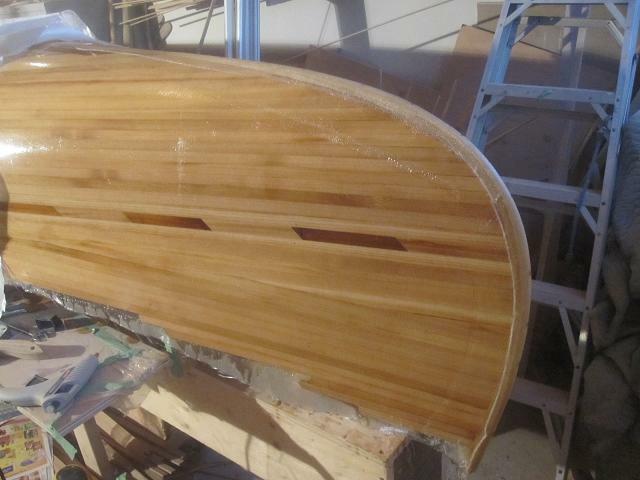 When I glass the hull, I cut back the cloth so that it follows the curve of the bow and stern but doesn’t quite go around. When the fiberglass has dried, I sand down the jagged ends so that the fiberglass is smooth where it meets the external stem. 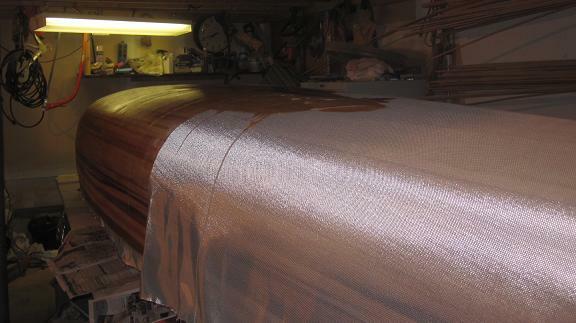 To cover the bow and stern, I use the excess cloth that I trimmed off when I initially covered the canoe. I apply some epoxy to the area that I want to cover and position the cloth. The epoxy helps keep the cloth from sliding off the boat while I fiddle around with placement. When the cloth is in place, I apply epoxy with a brush. I normally cut a slit in the cloth as I follow the curve to keep the cloth from bunching. From this point, it’s just a case of wetting out the cloth and ensuring that it lies flat against the surface. I then add a second, narrower strip over the first for added protection. The end result looks a little Frankenstein-ish, but sanding the layers when they are dry renders the seams invisible. I haven’t updated the blog since finishing the stripping because… well… sanding isn’t that interesting. That said, I was careful to sand away any glue lines between the strips because these invariably appear as white lines and look gross. I also filled any gaps between strips with epoxy and sanding dust. Bigger gaps (there were a few) were filled with cedar splinters and epoxy. But at last, with the sanding done, it was fiberglassing time. With the exception of a few hiccups, the glassing went well and I’m happy with the results. I’ve been slow to update the blog, so here’s a quick update. Last weekend, I recruited a friend to help me glass the inside of the canoe. It’s helpful to have an accomplice to mix the epoxy and catch the runs and drips and, of course, to enjoy a beverage when the work is done. You’ll notice the clips and clamps along the edge of the canoe. After a short while, we got rid of them. Once the glass is wetted out, they tend to get in the way and prevent the glass from properly adhering to the wood. You’ll notice that I’ve started sanding the outside of the hull in anticipation of eventually varnishing it. The sanded bits look milky. On a side note: The mind is a remarkable thing in that it is able to suppress unpleasant memories, so that when the unpleasantness occurs again, it’s new and fresh. To wit: I was again able to suppress the knowledge of how much sanding was involved in building a canoe. The very term “building a canoe” is misleading. Sanding is at least half of the effort and seems to bookend every phase of the project. Canoe building factoid #4 — The most under-appreciated fiberglassing tool is a belt, for it is invariably when your latex-gloved hands are coated with epoxy that your pants decide to migrate. 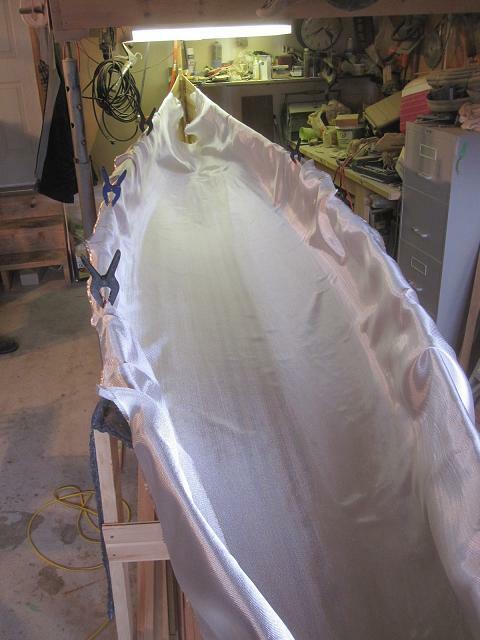 Today is the day I fiberglass the outside of the canoe. I’ve recruited a friend to do the mixing while I spread the epoxy. It’s important to select a friend for whom curse words will not cause affront. My preparations included vacuuming the shop and getting it as dust-free as possible. The last thing I wanted was to generate airborne dust as I shuffled around the canoe. Wet epoxy or varnish are dust magnets. I also lightly sanded the hull and then, realizing my mistake, vacuumed again. Finally, I got the heater running as the shop temperature was under 10° C/50°F. 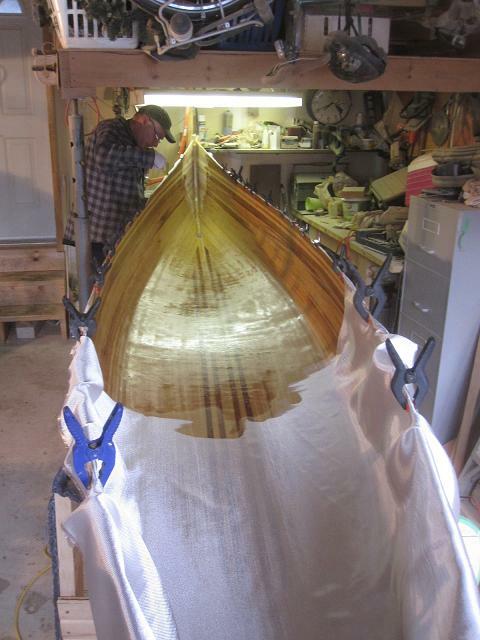 By the way, Nick Schade has a great video on YouTube that shows him fiberglassing a kayak. You can find it here. The reason I bring up the video is that I could describe the technique, but watching a master do it is far more informative and rewarding. 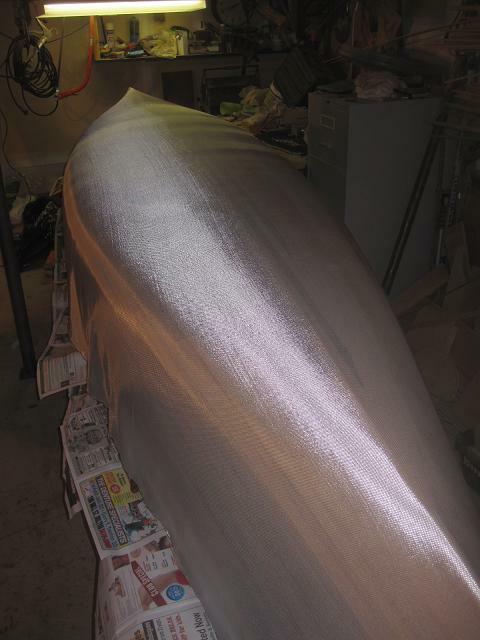 In fact, I fiberglassed my first kayak based on reading only. After seeing the video, I realized all of the things that I could have done better and differently. Now I make a point of watching it whenever I’m about to fiberglass anything — just to get into the zone. Here is the canoe looking quite elegant in a sheer white number. And here is the job in progress. Don’t dally when wetting out the boat. Don’t get hung up on one area. Move. Be in the goldilocks zone when removing excess resin. Don’t remove too little, don’t remove too much. For once, finishing the bow and stern was quick and easy and devoid of the “what now?” deliberations that characterized previous builds. I trimmed back the excess glass as far as I could. While the ends were still wet, I applied a 2″ strip of bias-cut cloth (saved from trimming around the boat earlier) over the stems. Using a brush and gloved fingers, I applied more epoxy until the strip was completely wet-out. There are some wayward strands and a visible edge to the strip, but some careful sanding once everything is dry should blend it in. Overall, the job went well. There are none of the air bubble problems that have plagued previous projects, nor does the canoe have an excessive number of drips. I can’t wait to get the boat off the forms and upright. Sanding is one of those things where it’s difficult to know when to stop. After all, how smooth is smooth enough? Usually I get to the point of diminishing returns. In other words, continued sanding serves only to reveal gaps between strips and doesn’t add much in the way of smoothness. When I get to this point and the canoe is as smooth as it’s likely to get, I put the sander away for a while. I should have mentioned something about the crack-filling process. There will be gaps between strips, either because of imperfections in the wood or a bad mating of strips. These gaps are easily filled with wood filler or a mixture of epoxy and sanding dust, mixed to the consistency of peanut butter. Wood filler (or plastic wood) tends to appear lighter than the surrounding wood when epoxied, while the epoxy/wood flour mixture tends to appear darker. While I’m glad that I didn’t use wood filler between strips, I should have used it to fill screw holes on the ash stems. Ash doesn’t darken as much as cedar under epoxy, and as a result, the epoxy mixture gave me dark dots on the stem. Live and learn. 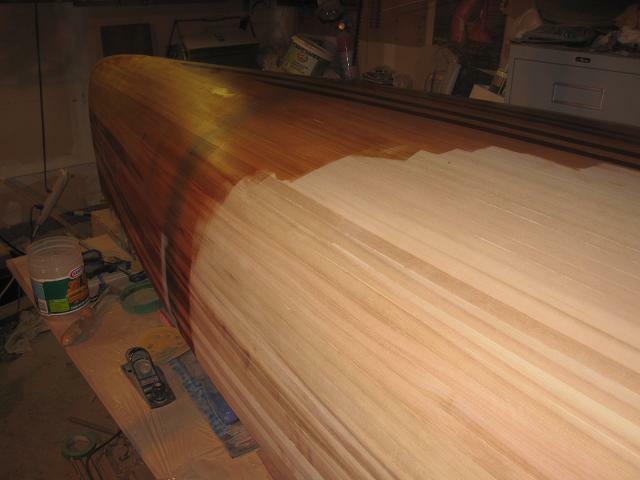 When the sanding was done (or rather, when I was done sanding), I put a sealer coat on the canoe. The sealer coat is optional, but I like doing it. 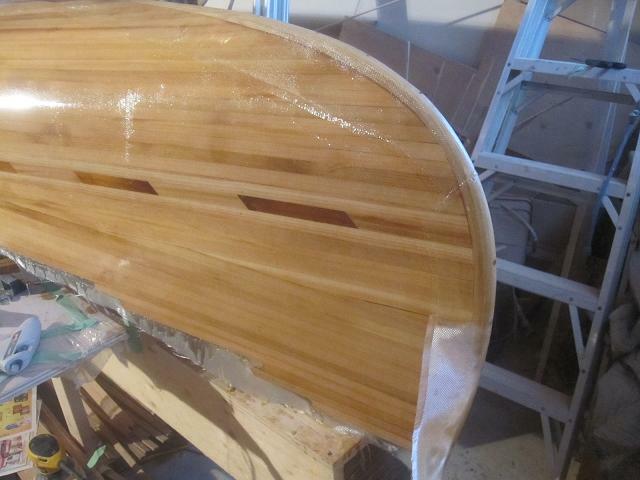 For one, it allows the wood to absorb epoxy so that it doesn’t absorb as much when the fiberglass is applied. 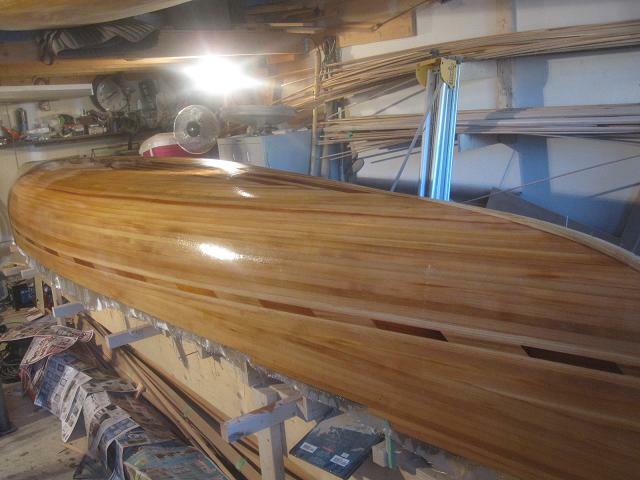 The sealer coat also gives you a great idea of what the canoe will look like when it is glassed. 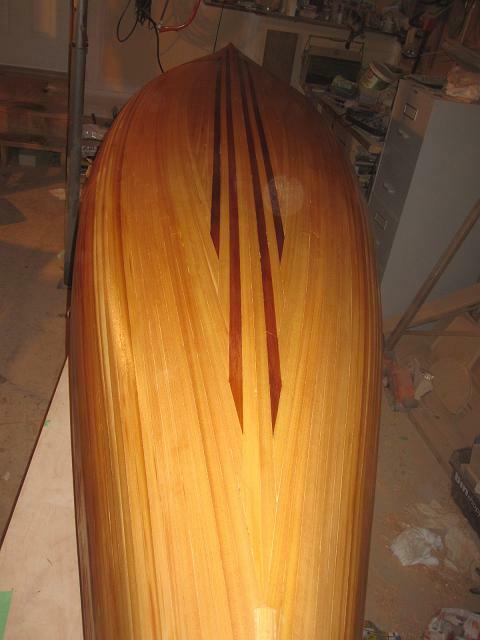 And here is a pic of the completed hull. 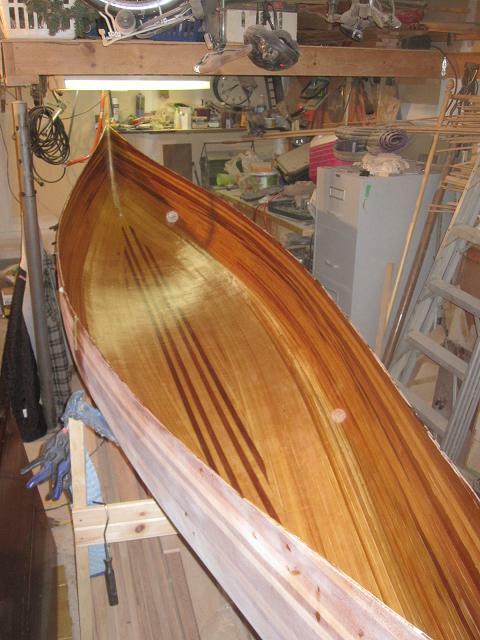 You are currently browsing the fiberglassing category at greybeard canoes & kayaks.